Some really interesting votes this time around. I expected a better turnout for Bull Durham and Field of Dreams, but it seems that *everyone* loves Moneyball. No complaints here, as any film based on sabermetrics that manages to also appeal to the non-baseball fan crowd is worthy in my book. This Week’s Poll: As many of you know, last week brought us the series finale for the U.S. version of The Office. While the show suffered in its last couple years, it still had a hell of a run, and it was sad to see it go. In honor of one of the best TV sitcoms of the 2000s, I want to know who your favorite characters of The Office are. Since there are just so many characters, I’m making this a pick two. The Warning Sign Update: Things have been slow around these parts, as the hustle and bustle of summer has given me little time to devote to blogging. Between going out of state and having friends and family visit here, my free time has been minimal. However, this week is looking better, and I hope to begin sharing regular content from this point on. Thanks to all who still visited during the lull — I greatly appreciate every single one of you! Anyways, glad to hear you’ll be getting back into the groove! Thanks, man. I really do hate falling behind. I’m stunned Moneyball won! It’s a really good film but with all of the good baseball films out there…. YEY for Moneyball! I have to vote for Dwight and Michael since their reluctant bromance was so hilarious but there were so many awesome characters – Stanley, Daryl, Kevin, Creed! I agree — the only characters I really didn’t like were some of the “guest” roles (i.e. Will Ferrell, James Spader). Never saw Moneyball, will have to give it a watch sometime. As for this weeks poll, I went with Michael and Pam. Dwight’s a good character, but I like Pam. Moneyball is definitely worth a watch. I like Pam a lot, too, even though the whole Jim/Pam arc got annoying in the last couple seasons. They made up for it with last week’s finale though. Bull Durham is definitely my favorite. I think I might agree with you. Glad to see Moneyball was the top pick. Michael and Dwight were my two picks, but the show has so many great characters. Yep, it’s hard to pick just two. It says a lot about the show that it can have so many memorable (and likable) characters. I think I can get behind that. It doesn’t really get into the actual playing of the game like say, Bull Durham. Ah, that’s why you’ve been MIA lately 😀 I didn’t vote last time as I hardly watch baseball movies but this time I went for Carrell and Krasinski. Hard to go wrong with those two! Tough poll for The Office, but I placed my votes for Michael Scott and Dwight Schrute. Love the show. Glad to see Arrested Development returning this weekend. Oh wow, I forgot AD was coming back this weekend! Thanks for the heads up! My breaks when it comes to blogging are a lot more frequent, longer and I certainly produce a lot less content than fellow bloggers like yourself whenever I find myself around these parts. It’s a struggle for me too, one that seems to be way over my head most of the time. Lets hope it changes at some point and my life becomes a little more permissible. As for the poll, I didn’t have the chance to vote, but it wouldn’t have changed anything since I would have cast my ballot for Moneyball as well. To me there’s no discussion in this matter. 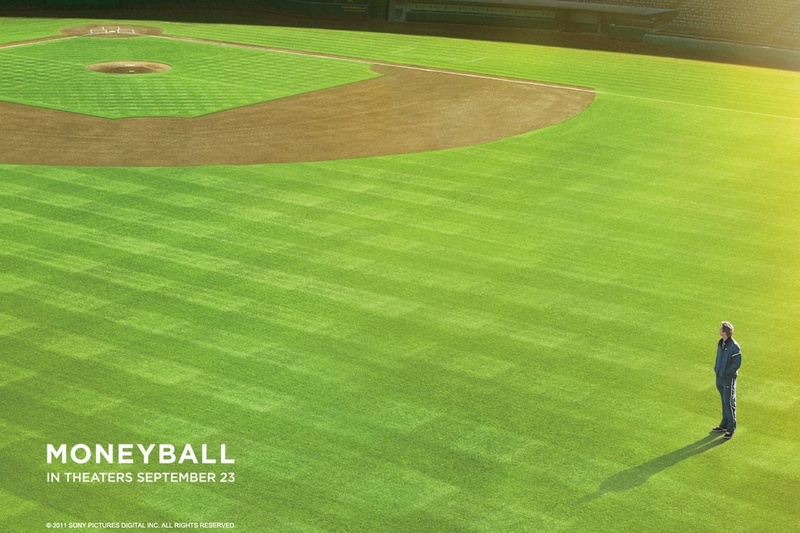 Moneyball is far and away the best baseball film I’ve ever seen, and one of the best sport-related films of all time. It’s only behind A Separation in my list for 2011, and it’ll probably find a spot in my soon-to-come Top 250 favorite films. Oh nice, glad to hear your top 250 list is almost done! I always enjoy seeing what you have pegged as candidates for your list, so I’m looking forward to finally reading it.